Light Commercial Vehicle « Global Market Insights, Inc.
With ever increasing demand for automobiles worldwide, the automotive glass market is expected to be a perpetual industry underlined with numerous innovations and regulations supporting its development. The rising disposable income especially in the developing economies will push the automobile production and create a favorable environment for the consumption of automotive glass. Designed and produced with safety in mind, glass is used in windshields, sidelites & backlites, parking lights, headlights and other sections of a vehicle. A USD 12 billion market in 2017, higher awareness regarding passenger safety and constant technological improvements in vehicle manufacturing will further propel the automotive glass industry. The overwhelming casualty rate arising from automobile accidents has highlighted gaps in vehicle safety. With glass being the most delicate part in a vehicle, the automotive glass industry is certain to witness a slew of opportunities in the coming years. 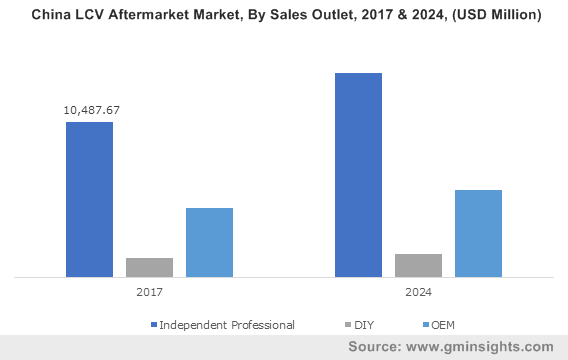 With the overall industry promising a 7% CAGR between 2018 and 2024, the United States automotive glass market will show considerable growth owing to safety focused legal amendments such as United Nations Economic Commission for Europe (UNECE or ECE) & Federal Motor Vehicle Safety Standards (FMVSS). These amendments are intended to ensure that the maximum fuel efficiency and safety features are given to the customers, leading manufactures to invest greatly in R&D. Another source of fuel for the segment is the unmatched production of vehicles in Asia-Pacific resulting from higher demand and tremendous FDIs supporting the industry. A significant amount of revenue is expected to be apportioned from light and heavy commercial segment owing to the rapid urbanization and the need for logistics in emerging economies. The evolution of automotive designs with changing lifestyle preferences and industry outlooks has led to the augmented use of glass in vehicles. The utilization of vehicles in several capacities & terrains lead them to face potholes, rocks and common fender-benders apart from accidents. In this regard, the laminated glass market has gained substantial traction. In fact, the laminated glass industry held a revenue of USD 7 billion in 2017. The product is further anticipated to record significant growth rate, driven by its durability and ease of installation. Elaborating further on the product landscape, tempered glass sales will also have a noticeable contribution to the overall automotive glass industry size. The product is estimated to procure 45% of the global share by 2024. The product is renowned for its strength and ability to withstand climate changes and heavy rains while providing a clear view. 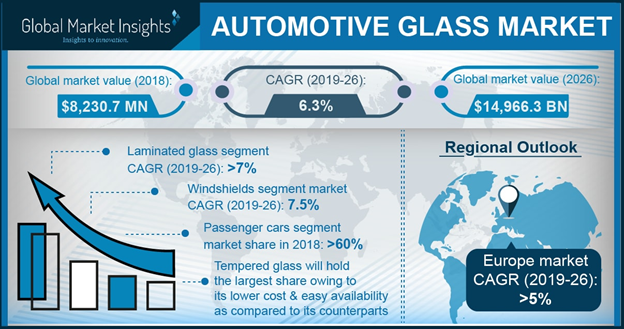 The automotive glass market is also boosted by consistent innovations in glass features and replacement of metal components by glass supports to reduce overall vehicle weight. Automobile features like sunroofs are also increasing in demand and the availability of sunroof is not restricted to luxury vehicles any more, with manufactures installing it in many low and middle-end vehicles as well. Tinted windows allow for reduced glare, security, privacy and enhanced aesthetics for automobiles, but their use is restricted in most countries through government regulations. Amidst this backdrop, upgraded glass products such as smart glass is gaining traction within the automotive glass industry with upward trend in the premium car segment. To emphasize the significance of innovations in the automotive glass industry, Glass Apps has introduced a leading smart glass technology which applies a Polymer Liquid Crystal film between two layers of glass and layers of conductive interlayers. Such a smart glass can help to alter the visual appearance of the windows as desired by changing the tint color and opacity by using electricity. It also diminishes the air-conditioning requirements as less sun-light enters the vehicle, limiting the carbon emissions. With the advent of smart technologies and consciousness of customers towards safer, more fuel-efficient vehicles has driven the research and development efforts globally and will provide an impetus to the automotive glass market. In terms of commercialization, the global renumeration portfolio is anticipated to cross USD 21 billion by 2024. This entry was posted in Automotive & Transportation and tagged Aftermarket Replacement Glass, Auto Glass Industry Statistics, Auto Glass Replacement Market, Automotive Glass Industry Report, Automotive Glass Market, Automotive Glass Market Share, Automotive Glass Market Size, Backlite, Global Automotive Glass Market, Heavy Commercial Vehicle, Laminated, Light Commercial Vehicle, Original Equipment Manufacturer, Passenger Cars, Sidelite, Tempered, Windscreen.